Scattered Melodies (SF077) is a compilation of Korean Kayagum Sanjo Music. 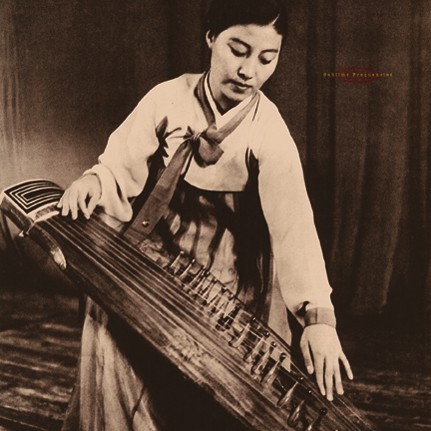 Sanjo, meaning "scattered melodies," is a form of stylized string improvisation developed in the 1890s originally for the Korean kayagum, a smaller distant cousin of the Japanese koto. Stark and haunting, falling in the gaps between folk and classical music, kayagum sanjo employs a gradually increasing tempo, focused improvisation (the “scattering of melodies”), elastic rhythms, and intense snaps and vibrato that seem to power through the hazy abstractions of the 78rpm recording technology (these are old, exceedingly rare records that have survived nearly insurmountable odds: invasion, occupation, war, division.) Presented here are a few of the masters of sanjo as it originally emerged in the early part of the 20th century on 78rpm recordings from 1925 to the early 1950s. This limited edition LP comes enclosed in a beautiful tip-on jacket with two-sided insert featuring extended liner notes by compiler Robert Millis.